Here’s a thought for you to consider before you start your next speech: where is your audience coming from? Yes, yes I realize that they may have traveled a great distance (or not) to come sit in your audience in order to hear your speech. However, that’s not what I’m talking about. Instead, what I’m getting at is mentally where is your audience coming from? When we give a speech, we need our audience to come along with us for the ride. The problem is that all too often despite understanding the importance of public speaking, our audience has shown up distracted and not ready to go on a ride with us. We have no control over what has already happened in their day and we don’t know if they are distracted or even ready to hear us give a speech. As speakers, one of the most important things that we can do is to realize that our audiences are coming from a different place than we are. The way that our day has gone so far is not the way that our audience’s day has gone so far. This simple realization is a key step in reminding us that we need to take steps to bridge this gap between us and our audience. One of the first things that we can do when we are giving a speech is to acknowledge that this gap exists. Simply by bringing it to everyone’s attention we’ll be taking the first steps to bridging it. Let your audience know that you realize that they may have had a busy day, difficulty getting to your speech, or even a lack of sleep the night before. By pointing out the events that may have defined their day so far, you’ll be bringing them into the moment and allowing them to arrive at the same station – the start of your speech. Once you’ve acknowledged the fact that the members of your audience are all coming from different places and you’ve allowed them to come together in the moment of the start of your speech, now you have to create an “on ramp”. This is going to be designed to allow them to get up to speed and join you as you deliver your speech. Your speech’s on-ramp is going to have to acknowledge that your audience is not currently moving when you start your speech. You can’t simply put the petal to the metal and zoom off into your speech and expect your audience to come along with you for the ride. Instead, you’re going to have to build your speech so that they can come up to speed with you. This means that in your speech you need to create a place for your audience to gather together at the start of the speech. You need to identify a place that everyone recognizes – this can be as simple as describing the way that your company currently operates. You then need to tell everyone where you’ll be taking them to (a place where your company makes more money) and then you have to invite them to join you as your speech pulls out of the station on its journey (“…let’s talk about how we can make things better here”). By doing this you will have created a way to bring everyone along with you as you deliver your speech. Although one of the benefits of public speaking is that you get to stand on a stage and look out over your audience, you may have no idea where they are mentally coming from. Most importantly, they are probably coming from someplace different than you and so you’re going to have to get them to come to where your speech is starting. 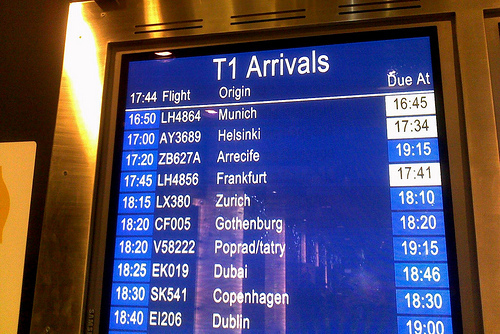 The first thing that you’ll need to do is to acknowledge that everyone is arriving from a different location. Next, you’re going to have to provide them with a common place to get to. Finally, your speech needs to establish an onramp that everyone can use to get onboard with your speech. The most important thing that you can do as a speaker is to realize that your audience will not be starting out from the same place as you are. This realization will allow you to take action to allow them to come from their many different places to your one place where your speech will be starting. By doing this you will ensure that you won’t be the only one who is listening to your next speech! Question For You: How long do you think that your speech’s “on ramp” should be – short and sweet or long and winding? As a speaker, almost every speech that you give will be different from the speech that you gave last time. However, there is one thing that will be common from speech to speech – you’ll probably find yourself standing behind a lectern. This means that you’re going to have to learn how to use this important speaking tool and not allow it to take away from your next speech.